Our week-long celebration of stories inspired by players' journeys in the continent of Skyrim continues today, with Ronin the Jedi's account of the worst helper on the face of Nirn. "Lydia move," Gavin Glass-beard roared, trying to fit through the door Lydia was standing in. "But look at this ruin we are in! I wonder what's further down?" She exclaimed, excited about something. "This is as far as we can go, see that rock? It is blocking our way forward." Lydia frowned but she didn't move, she just surveyed the room with her eyes. "Lydia, I swear to Talos if you do not move, I will make you carry all the dragon bone and scales again." Fear sprouted in her eyes and she moved aside quickly. To quickly in fact that she tripped over a switch. The switch opened the hole in the floor right under Gavin, he fell like a rock. "Lydia what in Oblivion...." he said as he fell, Lydia just screamed in dismay, not knowing what to do, she just looked down the hole wondering how to get down, for if she tried to jump she might break something. Gavin awoke after a few moments, his head was pounding, "What in blazes?" He proclaimed and remembered what had happened, "Lydia, you idiot! You made me fall down a hole." There was no answer, "Lydia?!" He screamed up towards the hole, it seems like he fell a good height, maybe a few floors down. Gavin pulled out his two handed flame sword Fire's Pity and was off down a corridor, peeking around every corner. It had probably been decades since anyone had last step foot in these ruins, who knew what was down here. Around every corner was a new creature to slay, a skeever here, a Drugar there, finally he came across a room that looked promising, there was chests lining the walls, and at the end of the room was coffin with the lid off. Gavin slowly made it to the coffin and peered inside, what he saw astounded him, it was an old elven blade, it had runes etched into the blade and the hilt had gem stones in it. This had to be worth a small fortune, he thought to himself. Gavin stuck his hand in and grabbed the blade, he looked it over a few times and smiled, his worries were over. Before he knew what was happening the sword flew from his hands back into the coffin, and a hand reached up and grasped the side of it and pulled itself up. What Gavin saw still haunts him to this day, A behemoth of a Drugar, and it looked angry. "By the 9 divine....I am screwed." As Gavin turned to run he bumped straight into Lydia, who had finally made it to him after 3 or 4 hours. They both fell to the floor. "Gavin I found you! I thought you had died or hurt something..." "Not now Lydia, RUN!" he screamed. They both jumped up and started to run but then the King Drugar let out a howl and lesser Drugars filled the room, surrounding Gavin and Lydia. Lydia pulled out the frost staff I had giving her and the ax named Hereafter off of her side. Gavin pulled out Fire's Pity and the battle began. Each enemy fell with ease and finally they took down the king, they acquired all the loot they could carry and made their way out of the ruin, when they got out Gavin sat on the ground and sighed with relief, "Thank the Divine we made it." As he looked up Lydia was staring at the ruin, "Are you ok?" She turned with urgency in her eyes and said, "Look Gavin! There's a ruin. I wonder what could be inside?" As he stared at her in disbelief, he sighed, "You, are an idiot" and a he continued to look at her she said nothing, and the fury took over and he used his power of the Dovahkiin, blasted her off the side of the mountain range the ruins had been on top of. He then started down the mountain, in search of a brighter companion. 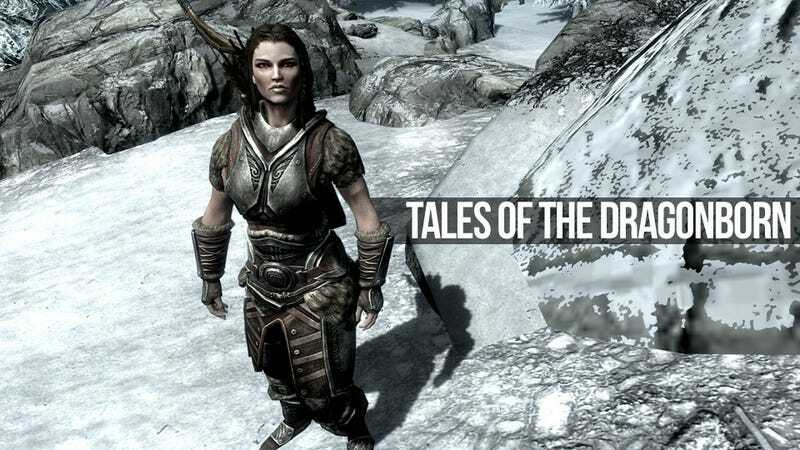 Want to see your Skyrim stories republished? Just comment in the original True Tales of Skyrim Adventurepost for a chance at fleeting interfame.